I still remember how excited Jamey was the first time he came in to show us his new project. He had gone on a road trip looking for inspiration when he stumbled upon the construction of this amazing bridge. 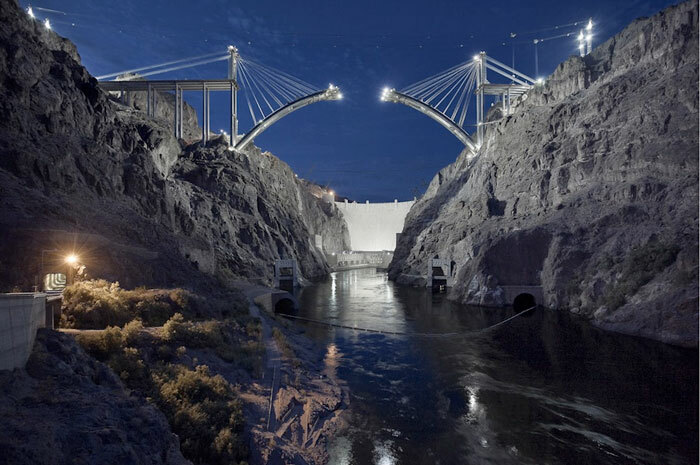 Stillings first encountered the bridge at Hoover Dam in March 2009, it immediately captured his imagination. After his first encounter he has returned to the bridge again and again until the construction was complete. The Mike O'Callaghan - Pat Tillman Memorial Bridge (bridge at Hoover Dam) was opened to public traffic at 8:47 pm on October 19, 2010 . An exhibition of Stillings' photographs opens at the Springs Preserve on Oct. 29, 2010 and continues through Jan. 23, 2011. If you are unable to attend this exhibit, you can view Stillings' work on our website. If you would like more information you can contact me at 505 988 5251 x121 or anne@photoeye.com.